The case we are going to present concerns a 28-year-old woman, suffering from intense anxiety about University Examinations. We consider this case as extremely interesting, because even though she had interrupted her studies in chemistry for four years, she managed to overcome her anxiety, graduate successfully and pursue further postgraduate studies in Great Britain, after undergoing cognitive therapy. The purpose of this article is to present the cognitive map of the patient and the procedures that led to the achievement of the therapeutic goals. Standard Beckian CBT, also called cognitive therapy (CT), is based on the cognitive model, which links cognitions, emotions, and behaviors such that cognitions shape behaviors and emotions, and unrealistic cognitions can lead to inappropriate emotions and behaviors . CT is a structured or semi-structured, directive, active and short-term approach. Its clinical use is applied to several psychiatric disorders i.e., anxiety-, personality- and eating-disorders, several situations of crises and disorders related to the use of psychoactive substances . Most approaches to CI agree to its basic principles which include that people develop adaptable and non-adaptable behaviors and affective patterns through cognitive processes, the functions of these cognitive processes can be activated by the same procedures that are commonly used in the human learning laboratory, and the task for a therapist is that of a diagnostician and pedagogue who evaluates dysfunctional cognitive processes and arranges such learning experiences that transform the existing cognitive patterns, and correlate them with behaviors and patterns of experiencing things [3,4]. CT’s goals are to restructure the dysfunctional cognitions and give cognitive flexibility when assessing specific situations and to solve focal problems and mainly to provide patients with cognitive strategies to perceive and respond in a functional way to the real world . CT is considered to have results with issues related to depression and panic disorders, i.e. verbal and non-verbal communication skills, assertiveness, criticizing and receiving criticism, refusing alcohol, and in general saying no . She could not attend the lectures or enter the lecture theatre ("lecture theatre phobia"). She could not concentrate, study for the exams or sit an exam. She avoided getting close to the University and she also avoided anything relevant to the University. She was not able to decide whether she wanted to get her degree or not. She was in a general state of anxiety about anything. She wanted to be perfect in everything and she worried about other people’s criticism. She would think about University all the time. Thus, she was not able to enjoy herself and was always sad. She avoided being with people and finally avoided crowded places. As far as her physiological complaints are concerned, it appeared that Helen suffered from: Permanent headache, Insomnia, Stomachache, Fatigue, Loss of energy, Drowsiness, Clenching of teeth while she slept that resulted in pain. The result of all the above was that she felt anxious, disappointed and melancholic. Her sister and father pressed her to continue her studies. They even wanted her to pursue postgraduate studies. Her father always told her that if she did not finish University, she would end up being a cleaner. "If you do not have a degree, you are a zero" he said. Helen felt that her father counted on her. "He has put me in the place of his son. I always felt that I had to adhere to what he wanted" she said. Her sister always criticized her calling her irresponsible. She was also interfering trying to contact Helen’s lecturers to ask them to be more lenient with her, something that made Helen furious. The only sector that Helen could function at the time of therapy was foreign languages. She was good at them and she could study without anxiety. She considered foreign languages a hobby and not "real work". Surprisingly, her parents were not interested in her performance as far as languages were concerned, so they did not pressure her. To make matters worse, their financial situation was very bad so Helen could not decide whether she should continue with her studies or find a job in order to solve her financial difficulties. Even though Helen felt that she is suffocating because of all these problems, it seemed that there was no way out since her parents were ill and she could not leave home. As it becomes apparent from the above short account of Helen’s family history, her parents and sister put too much pressure on her in relation to her studies. She was pressed and criticized for not being able to continue her studies. Considering this in combination with the rest "difficult" family environment it comes as no surprise that Helen developed an anxiety disorder. Dysfunctional assumptions and rules are general beliefs which individuals hold about the world and themselves which are said to make them prone to interpret specific situations in an excessively negative and dysfunctional fashion. In anxiety most dysfunctional assumptions or beliefs revolve around issues of acceptance, competence, responsibility, control and the symptoms of anxiety themselves [8,9]. a. "I am nothing unless I have a degree"
b. "I always have to please my family"
c.	"I cannot cope with the exams"
d.	"If I cannot cope with this, I cannot cope with anything"
e.	"I always have to do everything perfectly well; otherwise others will look down on me"
f.	"I always have to do what my father wants"
g.	"Students are snob and I do not want to be like them"
h.	"I have to be in control all the time"
i. "If you are used to something, you cannot change"
l.	I do not want to be snob like all the other students. Helen’s main cognitive distortions were stimulus generalization, catastrophizing and selective abstraction . The range of stimuli that evoked anxiety increased and anything that had to do with the University was perceived as a danger (stimulus generalization). As many anxious people , Helen tended to dwell on the worst possible outcome. For example, she thought: "If I fail the exam, I will not be able to finish University and as a consequence I will end up as a cleaner" (catastrophizing). Finally, it seemed that Helen was aware of her difficulties in handling the exams situation but not of her assets. Thus, she had a biased view of the degree both of the danger she was in and of her own vulnerability (selective abstraction). 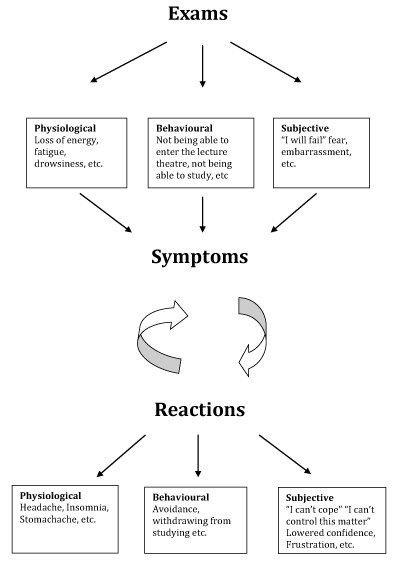 Figure 1 shows how the reactions to symptoms maintain the phobia by creating vicious circles that perpetuate fear. Avoidance maintains anxiety because it makes it difficult to learn that the feared situation (e.g. exams) is not in fact dangerous, or is not dangerous in the way, or to the extent that Helen thinks it is. Other important maintaining factors include thoughts, for example about the meaning of the symptoms of anxiety (e.g. "My brains don’t function properly"), or about the anticipated consequences of entering the phobic situation (e.g. "I will fail", "I will never be able to finish University"), and loss of confidence . Figure 1: Helen’s vicious circle Adapted from Butler . "TIC-TOC" technique: Helen could not study because of the negative cognitions she had concerning studying and University. The therapist focused on these "Task Inhibited Cognitions" and educated Helen to be able to monitor and challenge these dysfunctional cognitions and substitute them with "Task Oriented Cognitions" . Thus, Helen’s automatic thought "I am not going to make it" was substituted with "If I do not try I have no possibility of succeeding, if I do try though I have at least some possibilities". "Graded task assignment": The aim of this technique was to maximize the chances of success by breaking tasks into small, manageable steps . Hence, Helen was given small tasks to carry out. For example, she would study a few pages each time in order to become able to face this anxiety-provoking situation (studying). "Graded exposure": Exposure is defined as facing something that has been avoided because it provokes anxiety . Helen was encouraged to talk about University and try to visit University. She thus managed to be able to visit University and even write down the timetable of the exams. Finally, she managed to go to the lecture theatre to sit an exam with the presence of the therapist at first and then by herself. "Daily record of dysfunctional thoughts": Situations that precede unpleasant emotions were recorded along with the emotions and the automatic thoughts. At a later stage, Helen learned how to challenge these thoughts (a sample of Helen’s Daily record of Dysfunctional thoughts is given in Table 1). It should be noted at this point that Helen was not willing to do any homework. This was considered to be part of her problem since she could not concentrate properly. Thus, the record forms were completed in the therapeutic session. "I am not going to make it"
"I am doing well in foreign languages"
"I do not trust myself"
"If I try I have at least some chances of passing"
"I am afraid to take the risk"
Table 1: Helen’s daily record of dysfunctional thoughts. Despite the difficulties in treatment (Helen would not do any homework) the therapeutic results were quite impressive. This case study presented the main tools treating anxiety disorders and provided specific conceptual frameworks of cognitive therapy that were used effectively in therapy of this patient and affected her whole life so that she could lead a well adjusted life. Last, but not least in a follow-up session she mentioned that she has worked in a company in Great Britain for the last ten years after having completed her postgraduate studies. Beck JS, Liese BS (1993a) Cognitive Therapy. In: Frances RJ, Miller SI & Mack AM (Eds. ), Clinical text book of Addictive Disorders. (2nd edn), Guilford Press, New York, USA, pp. 547-573. Blackburn IM, Cottreaux J (2011) Psychotherapie Cognitive de la Depression. (3rd Edn. ), Elsevier Masson, Paris. Mahoney MJ (1974) Cognition and behavior modification. Ballinger, Cambridge, pp. 351. Wright JH, Thase ME, Clark MD (1997) Cognitive Therapy. American Psychiatric Press, New York, USA, pp. 174. Beck AT, Wright FD, Newman CF, Leise BS (1993b) Cognitive Therapy of Substance Abuse. Guilford Press, New York, USA. Monti PM, Rohsenow DJ (1999) Coping-skills training and cue-exposure therapy in the treatment of alcoholism. Alcohol Res Health 23(2): 107-115. Clark D (1989) Anxiety states: Panic and generalized anxiety. In: K Hawton, PM Salkovskis, J Kirk, DM Clark (Eds. ), Cognitive Behaviour Therapy for Psychiatric Problems. Oxford University Press, Oxford, England, pp. 472. Clark DA, Beck AT (2010) Cognitive Therapy of Anxiety Disorders. Science & Practice. The Guilford Press, New York, USA. Beck AT, Emery G, Greenberg RL (1985) Anxiety Disorders and Phobias: A Cognitive Perspective. Basic Books. Beck AT (1989) Cognitive Therapy and the emotional Disorders. Penguin Books, New York, USA. Butler G (1989) Phobic disorders. In: K Hawton, PM Salkovskis, J Kirk, DM Clark (Eds. ), Cognitive Behaviour Therapy for Psychiatric Problems. Oxford University Press, Oxford, England. Burns DD (1980) Feeling good: The new mood therapy. Ney American Library, New York, USA. Fennel MJV (1989) Depression. In: K Hawton, PM Salkovskis, J Kirk, DM Clark (Eds. ), Cognitive Behaviour Therapy for Psychiatric Problems. Oxford University Press, Oxford, England.